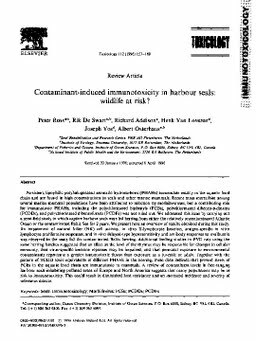 RePub, Erasmus University Repository: Contaminant-induced immunotoxicity in harbour seals: Wildlife at risk? Contaminant-induced immunotoxicity in harbour seals: Wildlife at risk? Persistent, lipophilic polyhalogenated aromatic hydrocarbons (PHAHs) accumulate readily in the aquatic food chain and are found in high concentrations in seals and other marine mammals. Recent mass mortalities among several marine mammal populations have been attributed to infection by morbilliviruses, but a contributing role for immunotoxic PHAHs, including the polychlorinated biphenyls (PCBs), polychlorinated dibenzo-p-dioxins (PCDDs), and polychlorinated dibenzofurans (PCDFs) was not ruled out. We addressed this issue by carrying out a semi-field study in which captive harbour seals were fed herring from either the relatively uncontaminated Atlantic Ocean or the contaminated Baltic Sea for 2 years. We present here an overview of results obtained during this study. An impairment of natural killer (NK) cell activity, in vitro T-lymphocyte function, antigen-specific in vitro lymphocyte proliferative responses, and in vivo delayed-type hypersensitivity and antibody responses to ovalbumin was observed in the seals fed the contaminated Baltic herring. Additional feeding studies in PVG rats using the same herring batches suggested that an effect at the level of the thymus may be responsible for changes in cellular immunity, that virus-specific immune responses may be impaired, and that perinatal exposure to environmental contaminants represents a greater immunotoxic threat than exposure as a juvenile or adult. Together with the pattern of TCDD toxic equivalents of different PHAHs in the herring, these data indicate that present levels of PCBs in the aquatic food chain are immunotoxic to mammals. A review of contaminant levels in free-ranging harbour seals inhabiting polluted areas of Europe and North America suggests that many populations may be at risk to immunotoxicity. This could result in diminished host resistance and an increased incidence and severity of infectious disease.